Fun fact- my mom is a competitive ballroom dancer, which means she has a big makeup collection for her performances! She usually wears drugstore makeup and doesn’t like to splurge on makeup products, but she was looking for a very high grade and long lasting full coverage foundation for her performances. This was already 5+ years ago, but the lady at Sephora recommended a Smashbox foundation, which was my first introduction to Smashbox. Being the curious teenager I was, I decided to try it as well. Unfortunately, we both did not like the foundation at all! It was very thick, oily, and uncomfortable. I hope they have since improved their formula! Since then, I tried a sample of one of the Smashbox primers (forgot which it was) and it made me break out. As you can see, my experience with Smashbox hasn’t been positive so I haven’t really tried any of their other products for a long time, until now! Hopefully, their lip products would be better for me than their face products??? I bought this lipstick ‘somewhat’ impulsively. I say ‘somewhat’ because I was looking for a dark, deep burgundy lipstick for awhile now although I didn’t know which brand I wanted. I went to Sephora one weekend and after looking around for awhile with no luck, I asked one of the girls there if they carried a lipstick similar to the Too Faced melted in berry red. 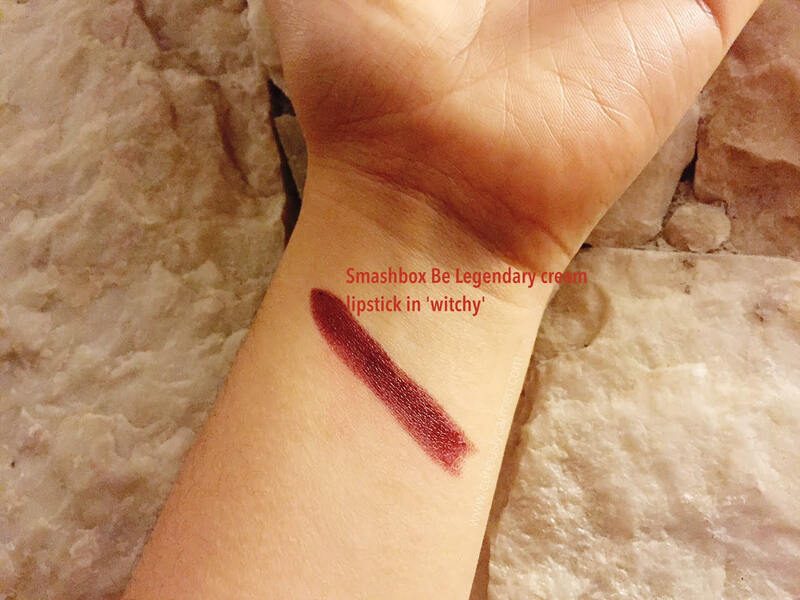 The girl suggested the Smashbox Be Legendary line in the shade witchy. I didn’t want to keep looking anymore, and when she swatched it for me, it was the definitely the perfect vampy shade I was looking for! 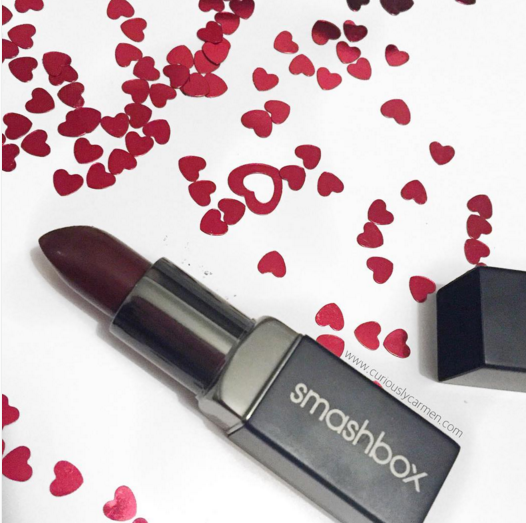 The Smashbox Be Legendary line is available in both matte and creamy shades. As you can see from the swatch, witchy is part of the cream line. I honestly didn’t have a preference for matte or creamy, I just really wanted a dark and vampy shade! As advertised, this lipstick is pretty creamy, smooth and moisturizing. It is also nicely pigmented. My favourite part of this lipstick is how smooth and non-drying it was. However, I did find that the lipstick did apply unevenly. You can slightly see on the swatch that the shade is a bit uneven. You can’t really see the unevenness in real life or in pictures though, unless you look really carefully. I also found that there were small ‘specks’ of colour when applying. I fixed this by dabbing the specks off with a napkin or by using more product to cover it up. Here is how I look with the witchy on! 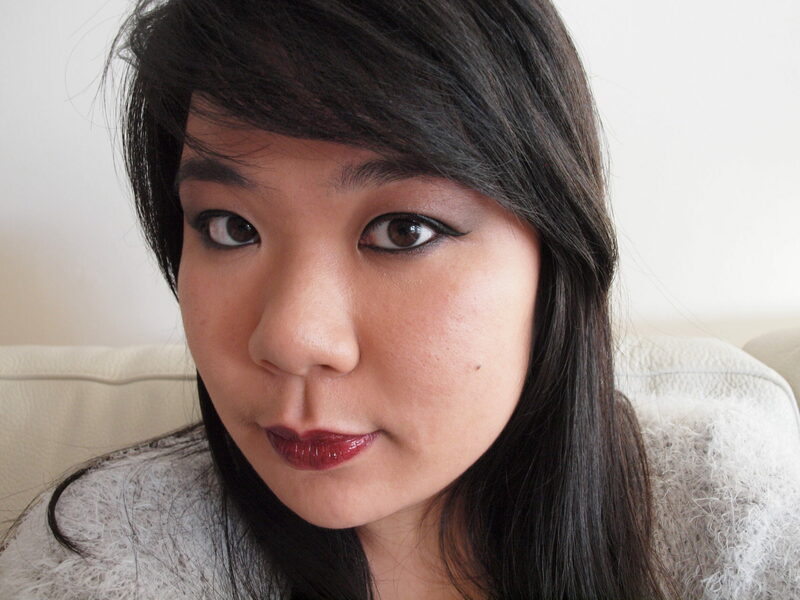 I was experimenting with liner on my lower lash line, which is something I rarely ever do, but wanted a ‘darker’ makeup look to go with the vampy lips. You can kind of see the ‘specks’ I am talking about on the bottom lip. Overall, I think this lipstick is alright. 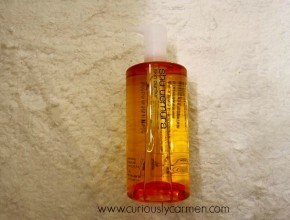 I don’t think I would repurchase this as there are cheaper options out there, but I don’t hate it either. I really love the shade and how creamy it is though! 6 Eye Makeup Looks With One Liquid Eyeliner (Part 2/2)! I am continuing my 6 different eyeliner looks with one liquid liner today! You can read part 1 here. I decided to separate the looks into two posts, because I thought that it would be too long of a single post. 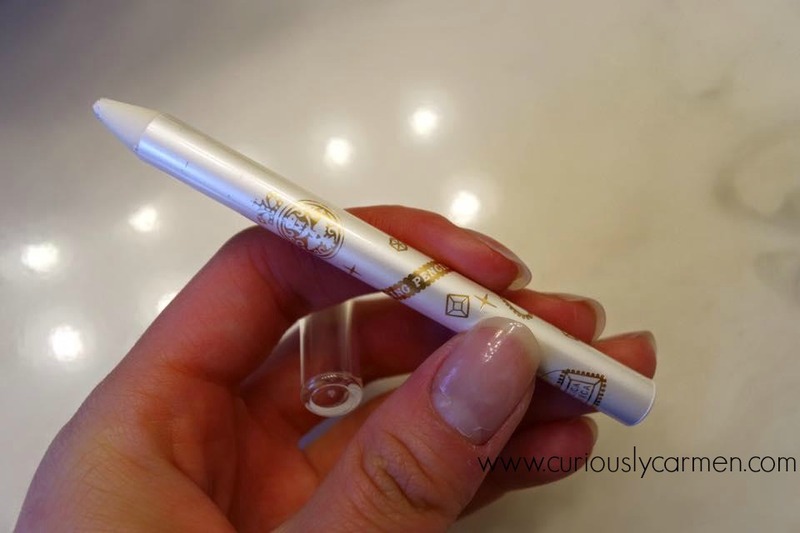 Dolly Wink is a very popular brand among the Asian beauty industry, it is probably the equivalent to the Kat Von D tattoo liner craze, but Dolly Wink is cheaper. 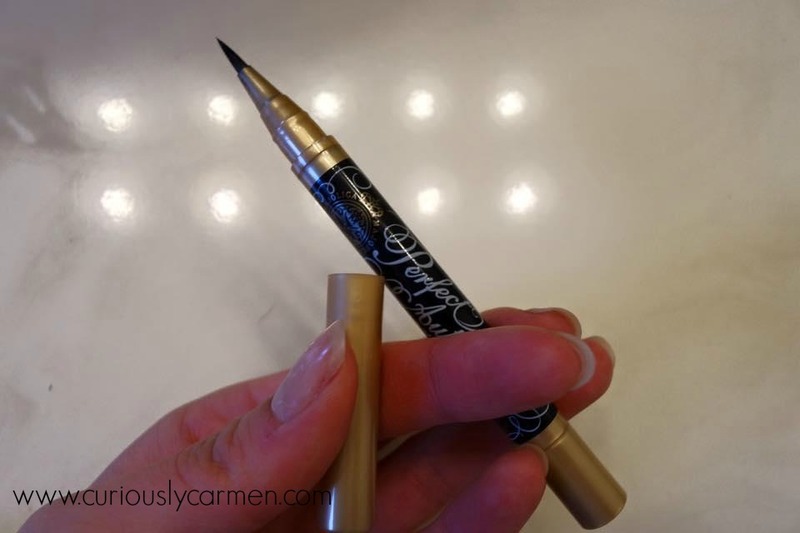 I like my Dolly Wink liner because the pigment is great, lasts long, and the fine tip of the brush makes it very easy to create different looks. 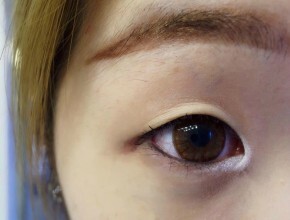 Here is my eye without any eyeliner! I took this picture to show the differences that eyeliner can do to your eye. 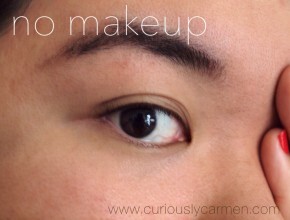 The staight line/under eye: Oops, I forgot to include the “under eye” in the picture as well! This is a combination of two looks. For this look, I tight lined my eye (more information on how to do that here), and then instead of winging my liner upwards, I followed the downward slope of my eye to create a straight, parellel line that extends further. 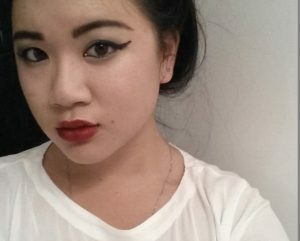 One of my favourite beauty gurus, Bubzbeauty, talked about it in her videos once so I decided to try it out for myself. 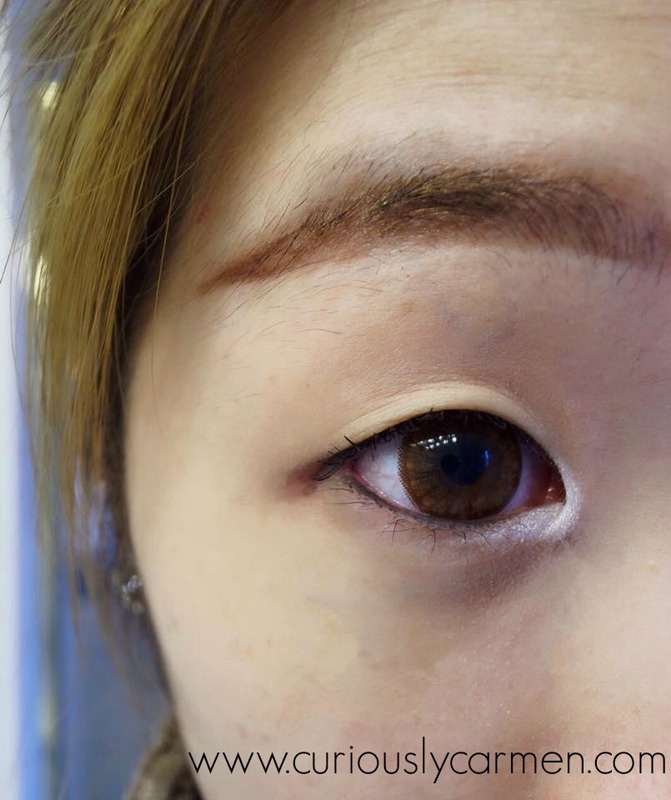 The straight line look is very popular in Asian beauty culture, as it gives the appearance of a rounded eye. The straight line also your eyes look rounder and bigger, while the classic winged liner makes your eyes look more sultry. I also used the Dolly Wink liner as a bottom liner as well! I normally never line my lower lash line, but I decided to try it this time. Lining your bottom lash line is pretty self explanatory. I used lighter strokes so that the colour was not as dark as the top. 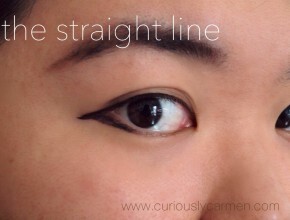 My friend, Pauline did a guest post for me and she is a big fan of doing the “straight line” liner look too! Read how she did hers here! This is another take on the classic wing, but with more drama and intensity 😉 Start by tight lining your eye, and then extend the wing out. The further you extend, the better! Egyptian makeup was all about a long, beautiful, and thick winged liner. After you have extended, go back and apply your liner over, so that the wing gets thicker. As I was creating this look, I extended my wing so much and it felt so weird! I wasn’t sure if I would like the end result or not, but I really do! I probably would save this look for special occasions, because it’s too intense for me to wear on a daily basis. I ended this look by lining my lower lash line as well! This time, I lined my lower lash starting from the inner corner, and used a bit more at the outer corner so that it would connect with the top line. 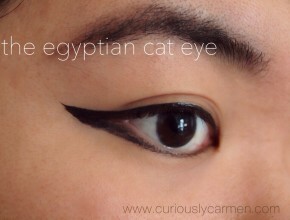 Speaking of Egyptian cat eye, my other friend Rachel, also wrote a guest post on a Cleopatra inspired makeup look! I love how intense her wing is! 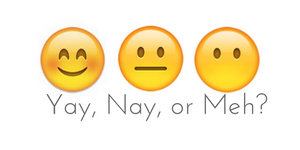 Which one of these would you rather try? Or maybe both?! Special blog post today- everyone, virtually meet one of my good friends, Pauline (She’s super awesome)! She has agreed to write a guest post for me and I’m excited to share it with you all today. 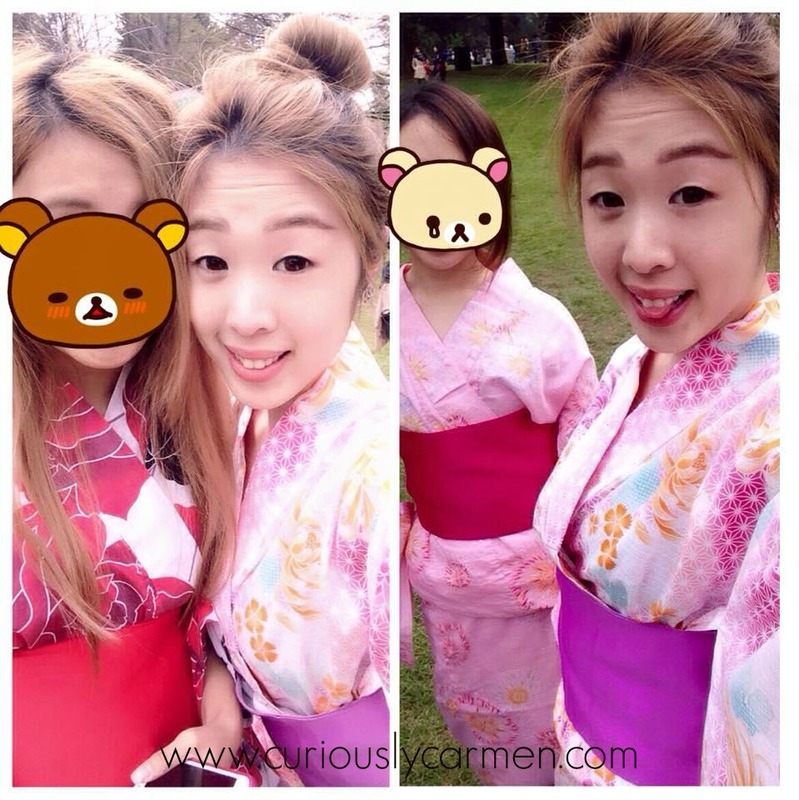 See what type of Asian cosmetics Pauline bought from Sasa.com and how she wore them to the Japanese cherry blossom festival. Hello everybody! I am doing this for my friend, Carmen, as a guest post, and will be the very first time doing this! So, hopefully this goes well… haha! I recently bought some makeup and face products from this super famous Hong Kong make up store: Sasa. I usually purchase my makeup and face products from here because it’s cheap and my skin seems like to like Asian brands of makeup/skin products. They also often do free shipping once in a while! 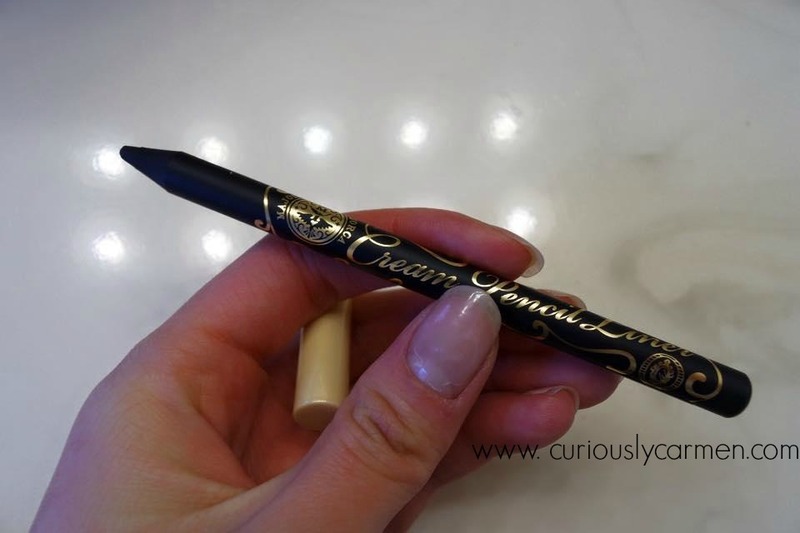 The first product I’m going to introduce is an eyeliner by Majorlica Majorca: the cream pencil liner. The second product is: Majorlica Majorca’s jeweling pencil. 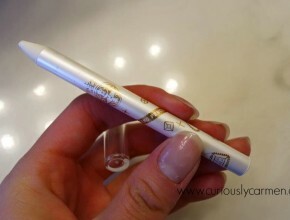 This product is basically a white eyeliner to put on your eye corners to brightening up your eye as well as giving an illusion of having bigger eyes! 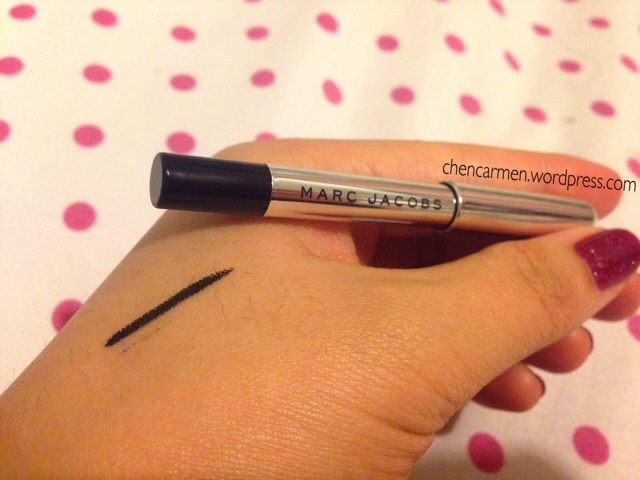 Third product: Majorlica Marjoca’s perfect automatic liner: This product was kind of weird to use at first. 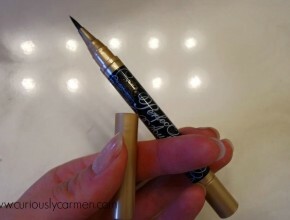 So, the first thing you do is twist the bottom of this eyeliner until the ink comes out from the tip. The con of this is that if you twist too much, the ink will splat out and comes into a big mess. However, after you clean that up, you can just apply that on your eyes just like any other eyeliner would … If you do not want to clean up the mess, this might not be the best product for you, because you will have to twist the bottom every time you want to use this product. And here’s me in a Yukata ☺ .. To protect my friends’ privacy, I have turned them into Rilakkuma and Korilakkuma. Okay, on with the other products! 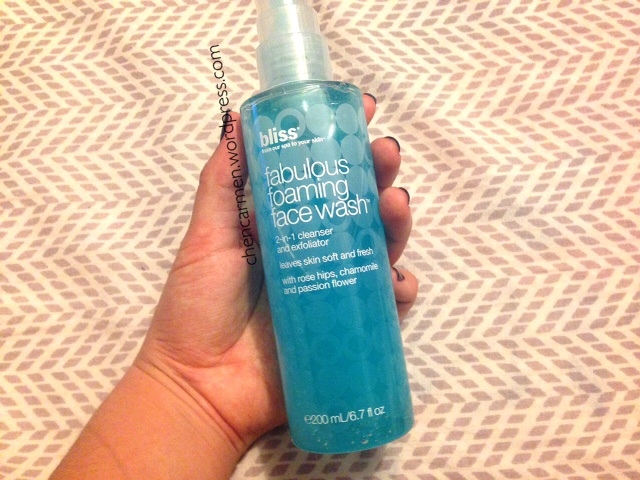 Your makeup is literally all gone, and you do not have to go through a second cleanser to clean your face. The oil also leaves you with smooth skin and feeling hydrated. The best part about this product is : THIS IS FOR SENSITIVE & DRY SKIN!!! Which is a big problem for me, because sadly, I have super sensitive skin … So now that I have found this, I rate it 10/5! 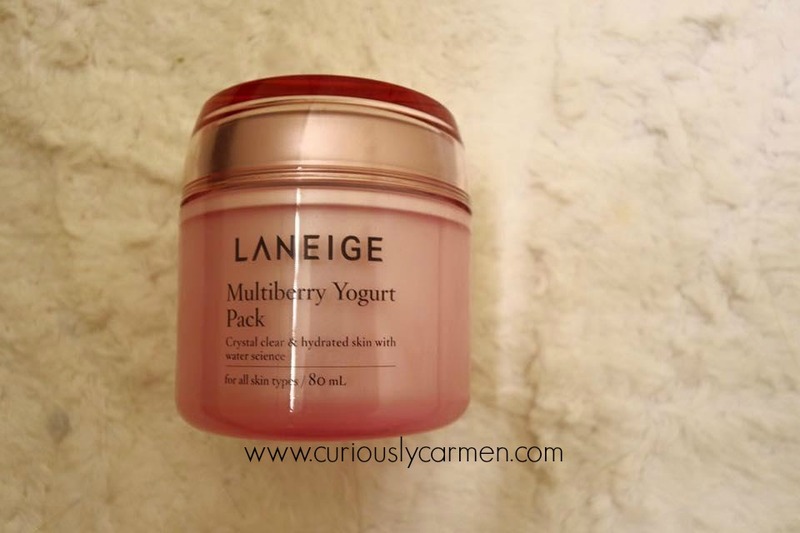 Last product I’m going to talk about is: Laniege Multiberry Yogurt Pack. I have mentioned above that my face is super sensitive … and this mask did not go well with my skin. I gave this mask a try because of all the good things I have heard about it. It also says that it is for “all skin types” – and let me tell you … It’s not. 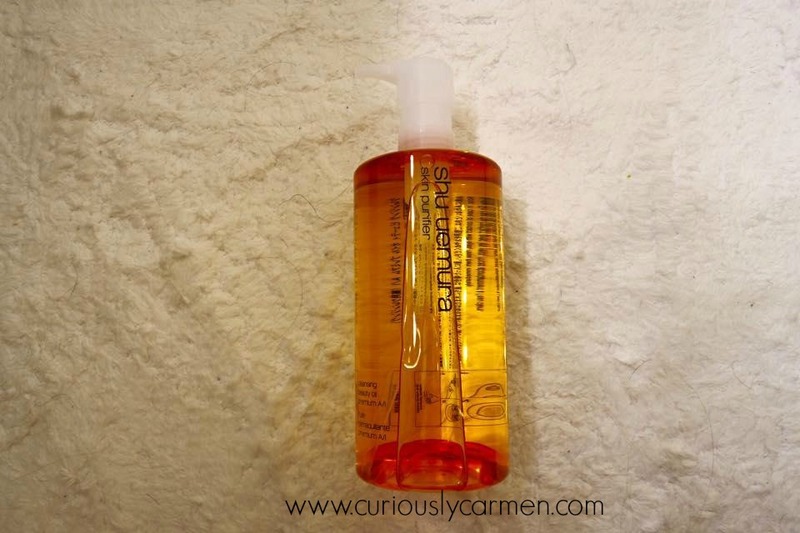 If you have sensitive skin, do not go for this product. My face reacted one minute after I put this on … The burning sensation and my face was literally all red like a cherry. 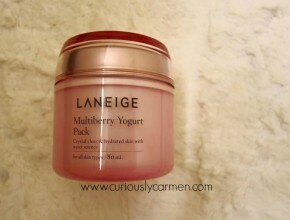 I must say, though, this mask smells like as if you are in a strawberry land … So the pro I can only say about this is that it smells super yummy. That’s it to my guest post! I hope all of you enjoyed reading about these Asian products and maybe try some out on your own as well! Thanks for guest blogging, Pauline! 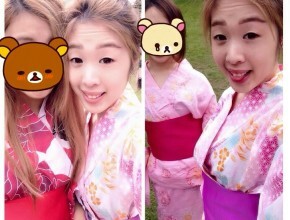 You look so good in the yukata. I want to wear one too! What are some of your favourite Asian cosmetics? After buying Sephora’s Draw the Line 2014 set and using most of the products for two months now, I decided it was finally time to talk about them! One of the products included in this year’s set was the Marc Jacob’s Highliner gel eye crayon, which retails for $30 Canadian (full sized product) at Sephora. The set only included the sample size, which was half the size of the full but I still thought it was a good deal with the set! Funny story, I wasn’t actually planning on using this until I had finished one of the other pencil liners in the set. Of course, I accidentally misplaced that one somewhere and the rest of the pencil liners I had weren’t that great, so I decided on opening this one. It seems like gel liners are all the rage right now, and for great reason too! I remember the first time I tried gel liner, it was one of the gel pots from MAC back in high school. Ever since then, I’ve loved gel liners for how smooth it glides on your eyelid and the intensity of the colour. Gel liners are more pigmented due to the way that it is formulated. 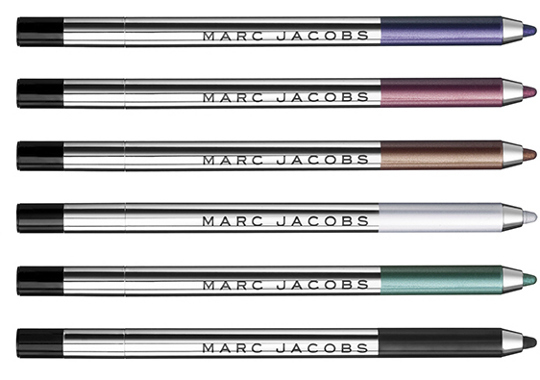 Combining the gel and crayon eyeliner into one, the Marc Jacobs highliner was born! I can’t think of a single negative thing about this product except for the cost, maybe. At first use, I loved how smooth and easy it was to apply, and how pigmented and intense the colour was. 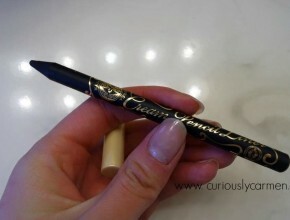 It also does not smudge the whole day and night, and is waterproof. In fact, this eyeliner is all that I’ve been using lately since it seems I’m always in a rush in the mornings now. It takes me 15 seconds to quickly tight line my eyes, and what results is an intense and striking black that lasts all day! Any makeup product that is easy and fast to apply, and long lasting, is good to me. One thing I don’t like about pencil products is having to look for my sharpener. This product comes with a built in sharpener so you don’t have to worry about it becoming dull. It also comes with a twist up bottom! I’ve also been looking for a replacement gold liner since my favourite gold shade of the Sephora + Pantone has been discontinued (how sad), I might give the champagne shade a try next time I’m in Sephora. But at $30 a pop, it does not come cheap =( However, I’ve come to realize that I much prefer high quality eyeliners that are worth the investment, than a cheap one which smudges or does not last the whole day- the annoyance and retouching up is not worth it. Which means I need to carefully manage my money (aka no more useless sugary drinks or random snacks)! What are your thoughts on gel liner? 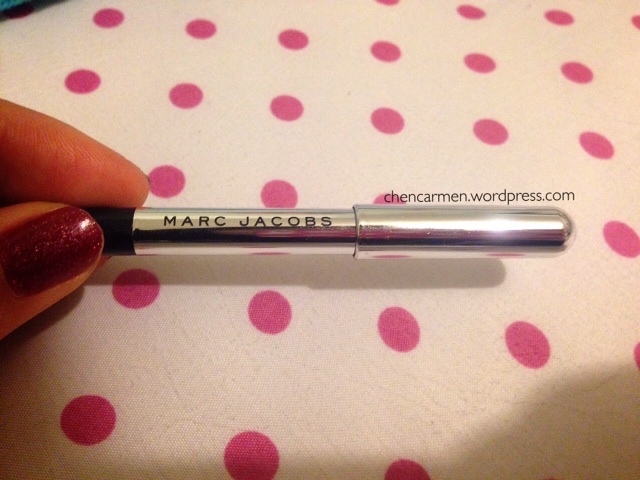 Have you tried the Marc Jacobs highliner before and what did you think of it?